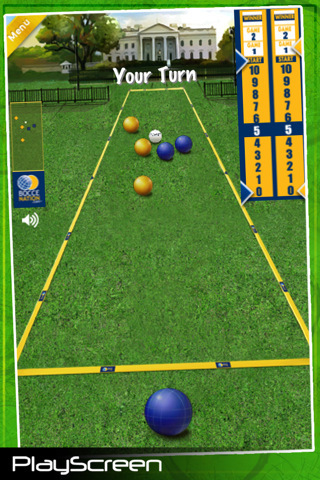 Bocce-Ball is a gaming app that mirrors the backyard ball sport, Bocce. The game is most comparable to bowling and it is usually played with metal or plastic balls in a sand or asphalt pit. The app was released by PlayScreen for an iPhone, iPod Touch, and iPad and an important thing to keep in mind when reading this review is that Bocce-Ball is completely free. A lot of you may know what Bocce is without knowing its name. Generally, two people play as they stand at the foot of a rectangular pit and throw a ball as far as possible within the given boundaries. If you were to mix shuffleboarding with bowling you would get Bocce. In Bocce-Ball, much like soccer gaming apps, you use your finger to swipe the ball. The controls are intuitive, so when you want the ball to go farther you increase the amount of gusto you commit to your swiping. To aim the ball you move it from left to right, positioning it before swiping. You can either play against the computer, or other Bocce-Ball users. You can hit your opponent’s balls and even use them to push your balls forward. The more balls you get to the opposite side of the rectangle, the more points you get. The person whose ball lands the furthest away wins. Your iPod is integrated into the app so that you can listen to your music while playing. In case you are having concerns about the legitimacy of Bocce-Ball there is no need to worry because it has been approved by the American Bocce League, which is definitely a load off. You can restart any round by bouncing the little white ball out of the court area. If you mess around with the settings you may find yourself playing Bocce in the foreground of the Great Pyramids of Giza, Stonehenge, the White House, or even Central Park. I love it when an app is free and isn’t bogged down by countless ads that pop up on the screen just as you are about to sling a bird into oblivion. Bocce-Ball is one of those mysterious, ‘how are they making a return off of this?’ type of app. Free of bothersome ads and offering a decent amount of fun, Bocce-Ball is a quality iPhone game definitely worth downloading. 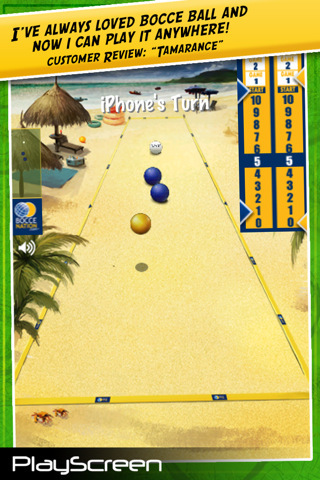 AppSafari review of Bocce-Ball was written by Vanessa Paszterko on February 18th, 2011 and categorized under App Store, Free, Fun, Games, Music, Sports. Page viewed 7649 times, 4 so far today. Need help on using these apps? Please read the Help Page. Points in Bocce are rewarded based on being the closest to the white ball. This game is spot on with everything to do with the sport, or game, or however you want to refer to it.